A Seoul court convicted ousted President Park Geun-hye of additional charges and sentenced her to eight more years in prison Friday, raising her total jail term to 32 years. Televised live, the Seoul Central District Court meted out the guilty verdict on Park, 66, and ordered her to forfeit 3.3 billion won ($2.91 million). Prosecutors had demanded 15 years. Friday's sentence adds to her 24-year jail term she's already been serving on 18 counts of corruption in a nation-rocking influence-peddling scandal that led to her ousting last year. She was arrested in late March, three weeks after she was removed from office by the Constitutional Court. In early January, prosecutors indicted Park on charges that include bribery, embezzlement and loss of state funds for illegally accepting 3.5 billion won from the National Intelligence Service between May 2013 and September 2016. The court on Friday acquitted her of the bribery charges, ruling that the NIS provisions of its funds to Park's office were not paid in return for any favors. But it found her guilty of embezzlement and causing losses to state funds, as the money was delivered upon her request and was partly misappropriated by her for personal use. The court acknowledged that it has been customary for the spy agency to provide funds as a supplementary budget to the presidential office from its own state coffers, known as the untraceable special activities fund. The fact that the then-spy chiefs had delivered the funds to Park's Cheong Wa Dae in a fixed amount, and on a regular basis, is far from the conventional way of paying someone a bribe, which usually comes in a lump sum payment at one time. Park is accused of spending some of the money to cover the bills for secret phones she used to contact Choi, maintenance costs for her private residence in southern Seoul and medical treatment. The funds were also used for incentives and bonuses for Park's close aides. 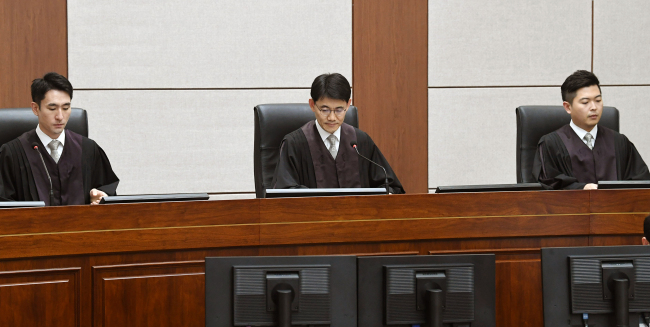 The court also found Park guilty of violating the election law. It said she abused her power to meddle in local politics and undermined the basic value of democracy and autonomy of political parties.